Entrepreneurs are like artists in a way. We protect what we create. Just like artists get emotionally attached to their art, our products and services are often our babies and we sometimes get emotionally attached to the stuff we’re trying to sell. So much so that sometimes what we’re selling never sees the light of day—because we’re too afraid to bring it to market. Using a minimum viable product philosophy can short-circuit this fear cycle and help you overcome decision fatigue that a lot of entrepreneurs (including me) can find themselves in. It can also show you— quickly—what’s going to fail and what’s going to succeed. So that you can build your business faster, and who doesn’t want faster growth in their business? A minimum viable product (MVP) is a product that is functional but has just enough features to sell. The point of a minimum viable product is not having all the bells and whistles, but to get feedback from your customers in the real world. It’s easy for entrepreneurs to get caught in the perfection cycle. We quite often want to have every single thing perfect before we bring a product to market. It’s important to have quality products in the marketplace. But this is the case where best is the enemy of good enough. It’s very easy to have a lot of opportunity cost in “perfect” products. Opportunity cost is the cost of waiting to bring a product to market. It could be lost revenue, or the cost of development of a product that may not sell, or a host of other issues. The other big reason to use an MVP is that it’s the best possible way to test if there is an actual market for your product. You simply don't know if your product is going to sell—until it does. In short, the MVP is intended to make sure that there is a buyers’ market for the product before you spend a ton of time and money investment in it. 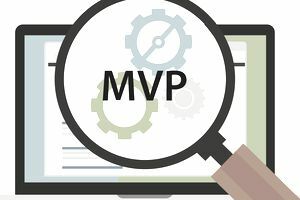 Developing a minimum viable product could take up the resources of an entire book, so for this discussion we’re going to go through a few short points about what an MVP should look like. Developing an MVP takes a step back from the normal product development process and lets you accelerate it. In the coaching space, a minimum viable product might be an area where you have expertise that you can an offer in a live class at a discount for early adopters. You can then hone your messaging in iterations based on real customer feedback before you build out the bulk of the coursework. This saves you a tremendous amount of time up front and makes sure that you have marketing that works to sell the product you’re promoting. An iteration is simply a new version of something. And allowing iterative development is one of the things that MVPs are the best at. For instance, you may go to market with a course on “how to create money from your email list", you may find that nobody wants to buy that, but maybe they were clicking on the ad that said, “12 email templates of double your profit”. You can iterate and your next course can be called “leveraging the 12 email templates the double your profit”. Since this is based on actual market feedback it’s much more likely to sell. By using an iterative process to develop your product and then bringing it to the market quickly, you can get incredibly valuable customer feedback that will help you create products that are going to sell. Creating products that sell is the true value of a Minimum Viable Product.